SISTER STYLE. ONE LONELY RAINY DAY IN JUNE. | Life Looks Perfect. SISTER STYLE. ONE LONELY RAINY DAY IN JUNE. Hello my fellow readers. Today's sister style, I'm afraid is just with little old me. 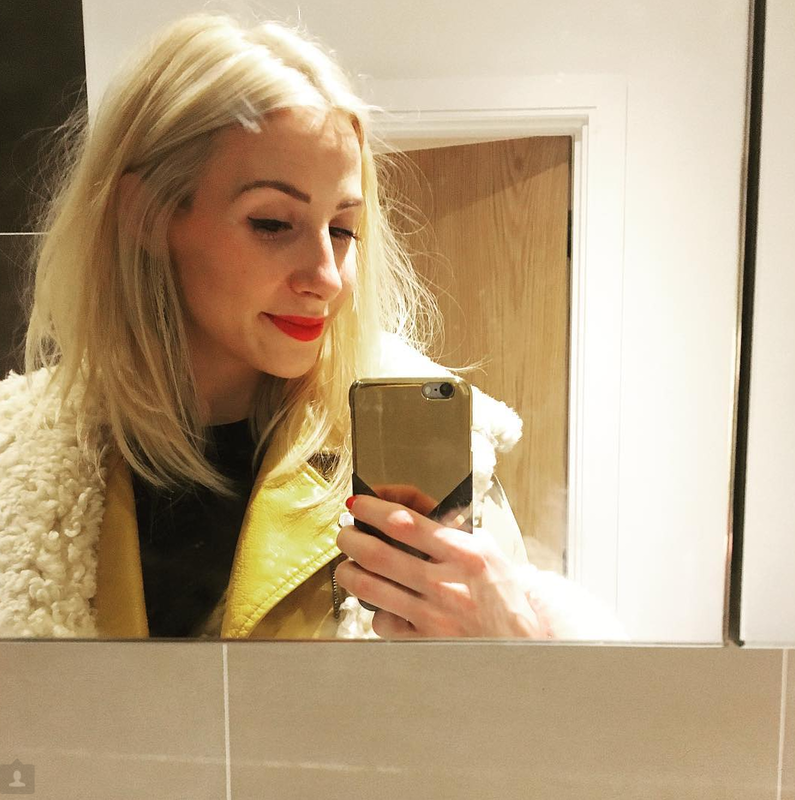 As you may have seen via our instagram Jess has been in NYC this week! So jealous and a tad lonely back in London without her! I'm not sure how the weather is where you are reading this but here in London, it has been grim! The sun seems to only show it's face for the later part of the day, which is when I'm usually exhausted and tucked up in bed watching Glee. Yes, I admitted it- I was always the hater... Now I love that show! As I have been at home in the evenings, as work is literally MENTAL and all I want to do is fall asleep in a hot bath, I must admit that the only clothes I have been wearing are crappy old work uniform tee's in the day and pyjamas at night. The glamorous life of a Londoner aye! So this weekend on my few hours I had off from work, I made sure I got into some normal clothes and actually wore make up. This may seem like a normal thing to do on the weekend but at work, I never wear make up. This means I'm usually make up free all week. You would think my skin would be fantastic but ladies and gents this is a myth. I still get spots and tired skin so whoever said not wearing make up is better for your skin, they are lying! So back to the clothes, I love wearing something comfy at home (I'm afraid the panda slippers are hidden from this post, which is what I would probably be wearing but for glamour purposes I opted for boots). I like this light summery peach jumper from Uniqlo, as it's fabric is so soft. 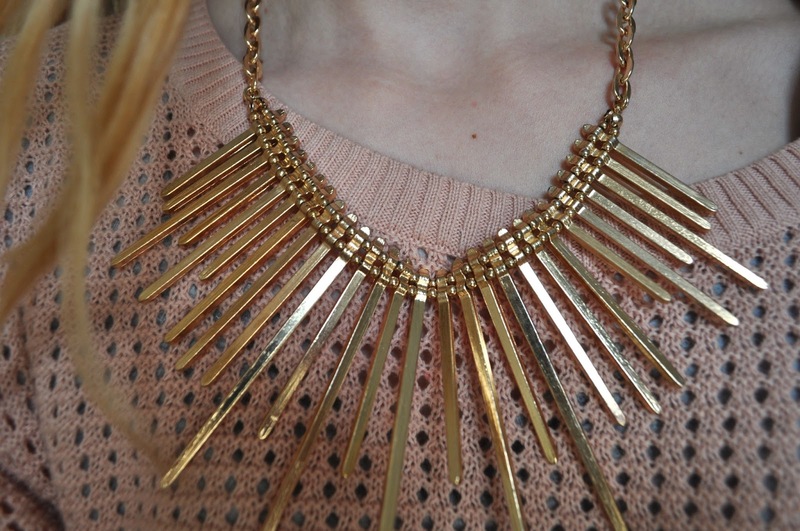 With the little holes in the knit, it keeps you nice and cool too, perfect for Summer. This jumpers fit is nice and loose, as I bought this jumper in a UniQlo large. I always buy bigger clothes with items like jumpers and t-shirts as I prefer a baggy fit on me. I usually buy most of my clothes in the men's section to be honest. They always have a better selection of what i like wearing, instead of hearts and flowers all over a jumper. Under this jumper, I usually just wear a light vest top in black so you can't see too much of whats going on underneath hehe. As I hate jeans at the moment, leggings are my only option. 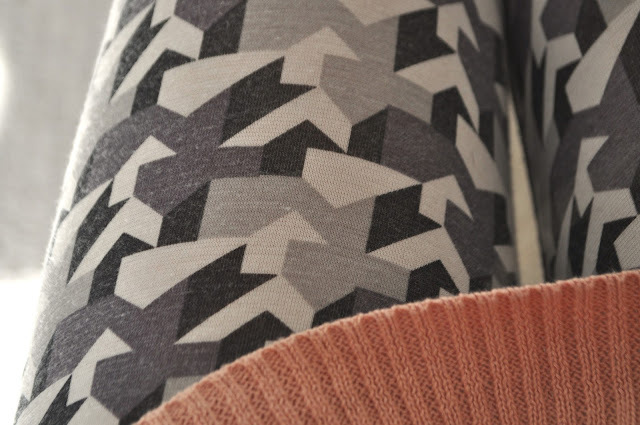 I love my Uniqlo heat tech leggings just for their pattern. 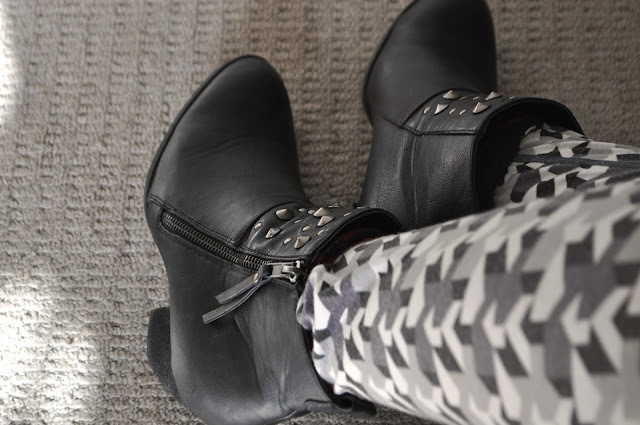 I love a crazy print and these leggings have been well loved. From Winter to Summer, rain or shine, I always wear these babies. 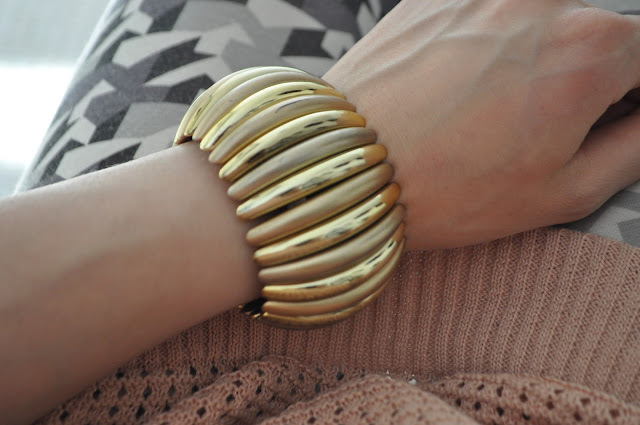 With a simple outfit, I love me some gold jewellery! Wearing a statement necklace and bracelet, it turns just keeps this casual outfit into something a little more glamorous. Both cost me less than a tenner, which is always a bonus. Thank you Primark! Hope you like the outfit! I am sure when Jess is back you will be seeing a bit more us two if the sun pops out. As we do the flowers for Wimbledon Tennis, I will try take a few Sister Style pics there too if you have never been or live on the other side of the globe or are just interested in my wardrobe hehe. Till then lovely readers. Jumper Uni Qlo - £25.99, Boots Primark - £20.00, Leggings Uniqlo - £9.99, Bracelet Primark - £3.00 & Necklace Primark - £4.00.